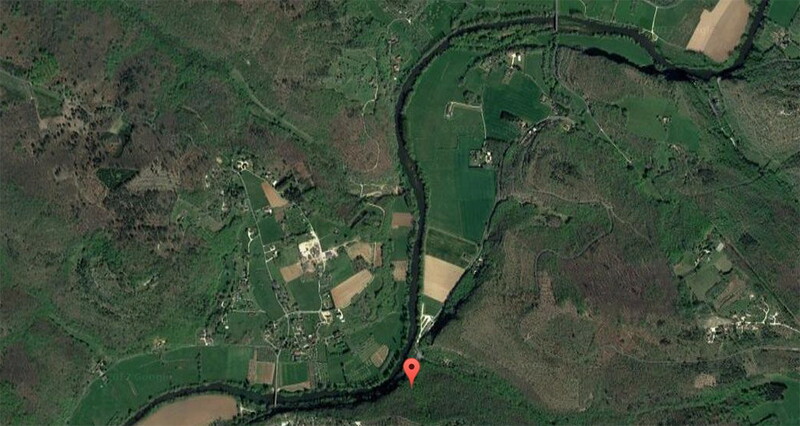 Location of la Grotte de la Forêt. To the north may be seen the major bridge over the Vézère and the cliffs of la Roque Saint-Christophe to the east of the bridge, while to the west of la Grotte de la Forêt is a minor bridge over the Vézère. 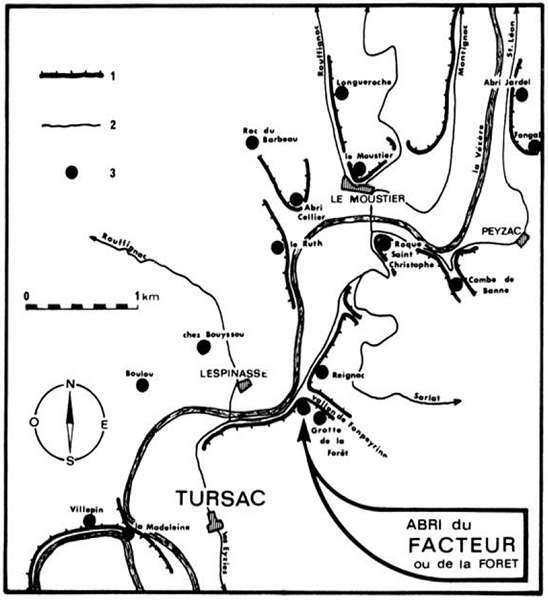 Map showing a Grotte de la Forêt, l'abri du Facteur (or l'abri de la Forêt) and Tursac. Plan of la Grotte de la Forêt. 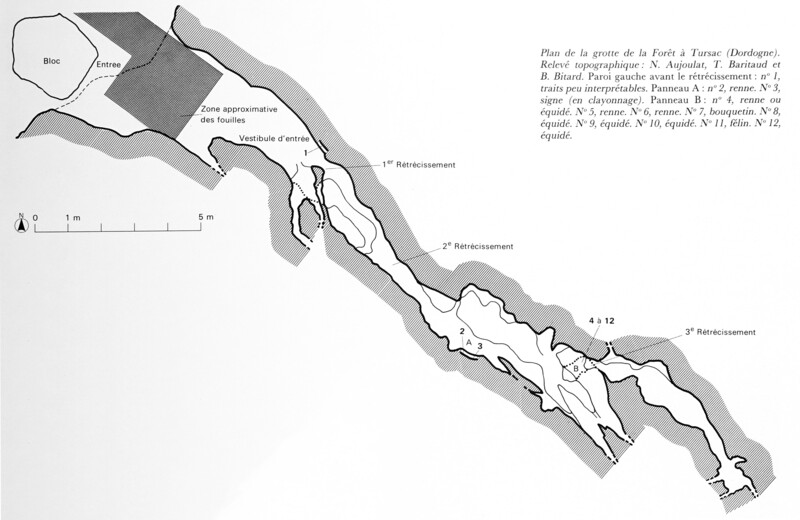 Topographic survey: N. Aujoulat, T. Baricaud and B. Bitard. Left wall before the narrowing: No. 1, not very interpretable. No. 4: reindeer or horse. The small Grotte de la Forêt lies between Moustier and Tursac. 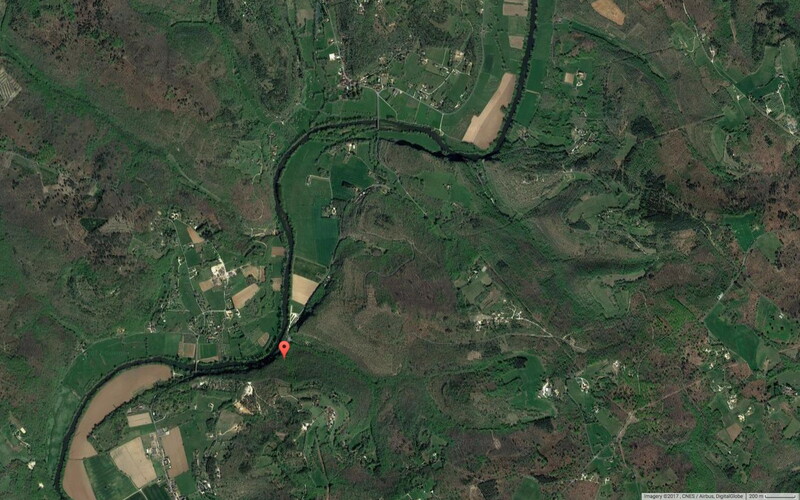 It is at the junction of the valley of Fontpeyrine and the Vézère, between the cliffs of Reignac upstream and Lespinasse downstream. The entrance is set back from National Road 706, and is a hollow at the foot of a limestone cliff of low height, concealed by a great deal of vegetation. Near this cave are a number of other important archaeological sites, including l'Abri du Facteur, Tursac, la Madeleine, le Ruth, Abri Cellier, and le Moustier. It is a small cave, about twenty metres long, and follows the path of a vertical fault. 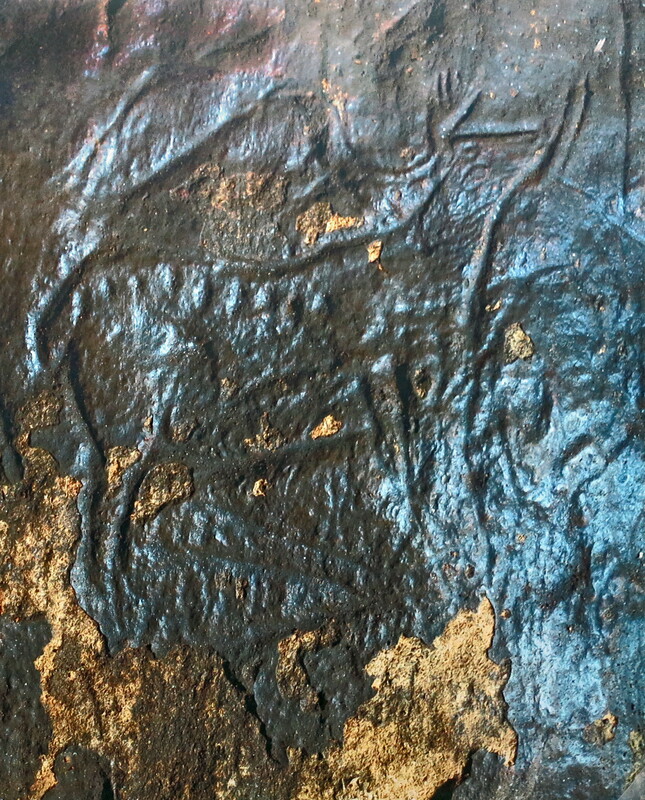 The presence of narrow sections of the cave makes progress and access to the engravings difficult. An ancient concretion covers the walls and niches of the first two thirds of the cave. The axial gallery, oriented north-west-south-east, is nearly rectangular. From the vestibule of the entrance, cluttered with rocky blocks detached from the roof of the shelter, two impracticable passages leave to the side. A few metres from this point, the corridor divides into three branches: two are impenetrable, the left makes it possible to access a local widening of the fracture. The final passage narrows before the engravings, and is just as difficult to cross. A room follows, split into two regions by a rockfall. The figures are on the right-hand wall at the entrance of the narrow passageway, and on the left-hand wall at the southeast end of the gallery. At this point, we are 17 metres from the entrance. Beneath the cornice with engravings, a narrow section connects the main axis of the cave with a lateral extension whose accessibility has been reduced by an undesirable obstruction. Nothing indicates that it was frequented by prehistoric man. 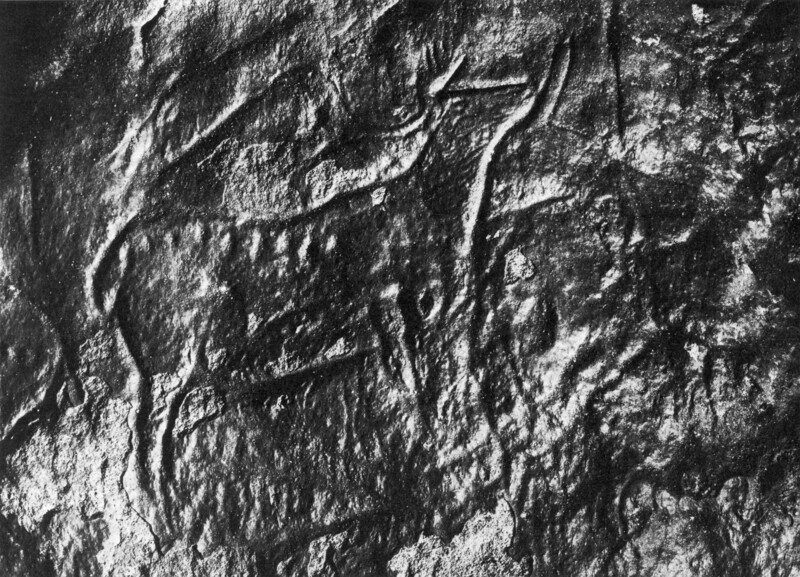 Reindeer on the wall of the cave, original. The discovery of the engravings of this cavity is due to D. Le Dren. During the summer of 1952, a speleological survey in the region of Tursac led him to explore the numerous cavities hollowed out in the cliffs of this region. After entering the cave, after a painful crawl he reached the figure of the first reindeer, the most important parietal creature. In the company of Abbé Jardel, Abbé A. Glory traced these engravings on April 22, 1953, and in the process discovered several other graphics. Seven metres from the entrance, and before the narrowing of the passage, the first uninterpretable drawings are encountered. They were incised on the left wall, a few centimetres above the present floor. At the other end of the fault line are also some isolated signs (straight and curvilinear signs). 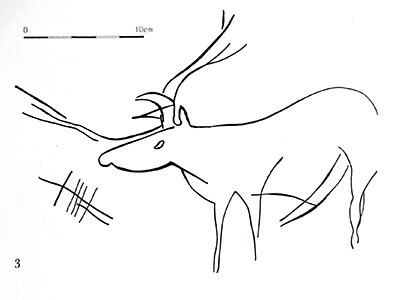 The first figurative panel (figure 3) is decorated with a beautifully executed reindeer design (no A 2). An entanglement of tenuous incisions precede it. Its appearance is reminiscent of that of a wattle, or woven fence (No. A 3). The second panel, 1 metre above the present floor, constitutes the principal composition (Figure 4). In this place, the roof is high enough that it allows for an erect standing position, rarely possible in this cave. The engravings of animals, nine in number, are grouped on a limited surface (60 cm by 95 cm), inclined at an angle of 45° with respect to the horizontal. The left subject is partly modelled in clay, the rest of the composition is incised into the rock. A thin film of calcite seals this frieze. This concretion is associated with a natural pigment of black colour, doubtless an oxide of manganese. The fragility of the support is extreme; large scales of carbonate material have been detached, exposing the bright yellow underlying rock. The central subject is, however, a magnificently rendered reindeer (no. B 6), with its head erect, the antlers thrown backwards, the limbs in vertical extension. Details abound: eye underlined with a curved line, lower lip slightly turned down, nostrils, punctuated flank, as well as an abundant mane shown by parallel streaks, attributes of a male subject. Around this cervid are clustered several sketches of animals, complete or only partially executed: the very altered support makes the reading of some difficult. The quadruped, a reindeer according to Abbé A. Glory, or an equine (no. B 4), located at the left end, demonstrates this state of affairs. The same is true of the drawing on the opposite side, identified as a feline (no. B II). 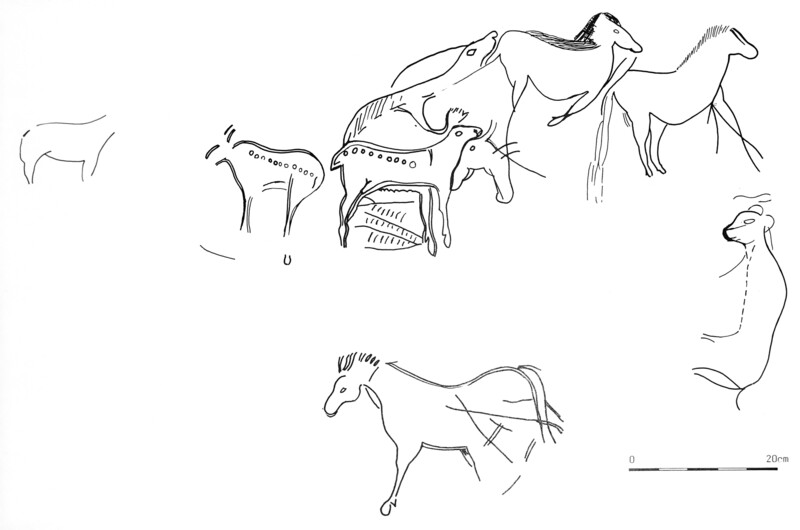 This census should include an equidae, located at the bottom of the panel and the contour, also damaged (No. B 12). As can be seen, only the subjects engraved at the periphery of the area have suffered, the others are in a satisfactory state of conservation. But let us return to the central subject. 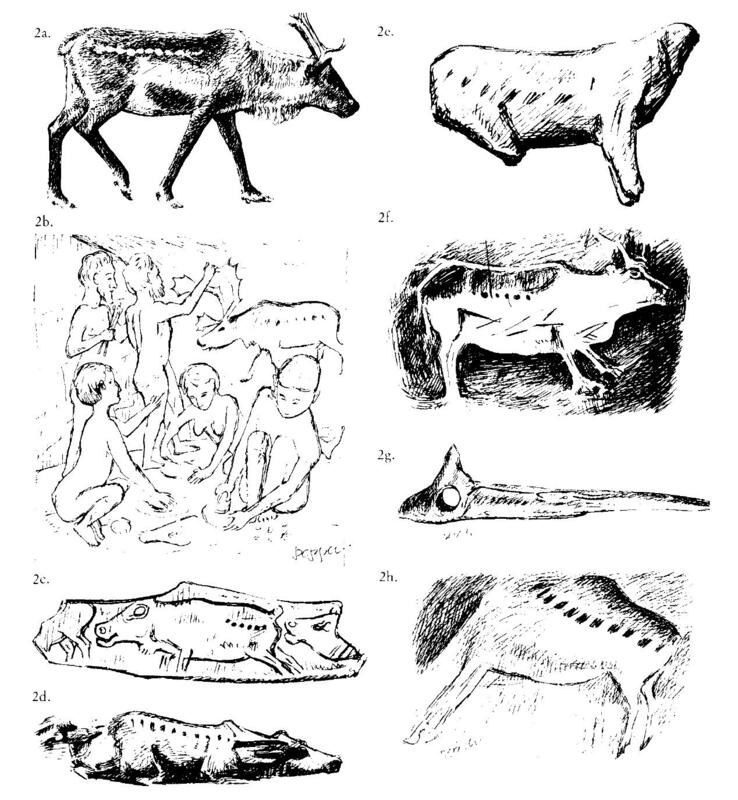 To his left and turning his back, a reindeer of identical design has a similar graphic on the flank, marked by the presence of a row of nine cupules arranged parallel to the dorsal line (No. B 5). Moreover, and to finish this description, one should not ignore the many non-figurative designs distributed on the right part of the panel. The excavations carried out by D. Le Dren in the filling of the entrance vestibule brought to light an extremely rich fauna, some fragments of flint and two fragments of a human jaw, collected on the surface. Numerous and varied osseous remains have been excavated from the sediments of the axial diverticulum, some in the superficial layer, others under the stalagmitic floor pierced during clearing. At the foot of the second panel D. The Dren collected 'a small quartzite quartzite scraper', a dating element for Abbe A. Glory, who noted: 'The style of the first reindeer is due to the awkward gestures of a bad Aurignacian pupil or Perigordian, while the second reindeer was traced by a skilful Magdalenian' (Le Dren et al., 1953). But it is necessary to take into account the aptitude of each person for drawing. The engraved plates of Limeuil are not all of an excellent layout. It is therefore possible that in a cave so little ornamented, all the graphic manifestations are of the same period. The Grotte de la Forêt is part of the very limited set of caves adorned with development limited to a few tens of metres, and access to which is particularly difficult. The effort required to achieve the engravings can, to some extent, be compared to that provided during a progression in a much longer cavity, with no other obstacle than distance. The small reindeer (15 to 20 cm) with punctuated flanks are not unlike those encountered in other ornate cavities, in particular at La Mouthe (last room) or les Trois-Frères (Boyau du Rhinocéros et Salon des Petits Rennes). The antler of the right cervid reproduced in a uni-angular perspective, the proliferation of anatomical details, the observation of a partial animation given to this animal by a taut neck and a raised head, seeming thus to sniff the air or to bellow in the rut, bring this image closer to realistic representations. The numerous deteriorations described in the engravings, due to the passage of wild beasts as well as those of unscrupulous visitors, forced the custodians of the cave to take radical measures: the entrance to the cavity was simply walled up. 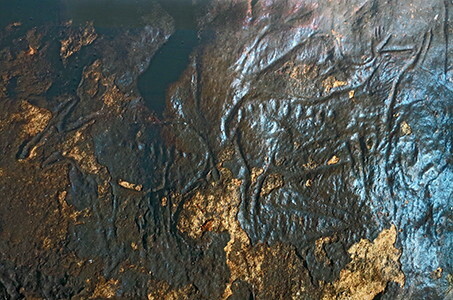 Two engraved reindeer from la Grotte de la Forêt. Each shows a distinct line of markings on the coat, formed in this case by engraving into the surface, and now known as Pepper's patches. Virtually all descriptions of coat colour in  Rangifer   fail to mention a series of light-coloured patches or short vertical stripes that occur on the dorso-lateral or lateral surface of the thorax and lumbar regions and as irregular blotches on the upper lateral surface of the rump or hip region. These are not patches of worn pelage, breaks in the pelage over individual ribs, nor lumps and discoloured fur caused by subcutaneous warble larvae or their scars. These 'Pepper's patches' consist of longer, stiffer hairs, sometimes twisted and of a lighter colour than the surrounding fur, from which they are sharply differentiated. Fragment of a split rib. Length 108 mm, width 32 mm, from Le Morin. This pendant from Laugerie-Basse has been engraved with the hindquarters of a reindeer cow. 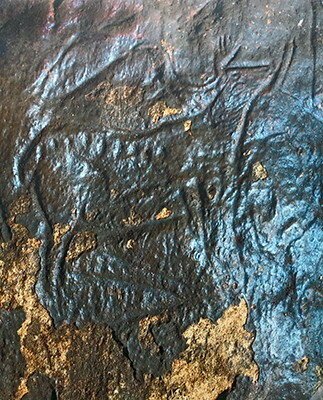 Note the line of decorative notches carved along the flanks of the animal. a. Rangifer t. tarandus. ♀. Whipsnade Zoo. Sketch by H.P. 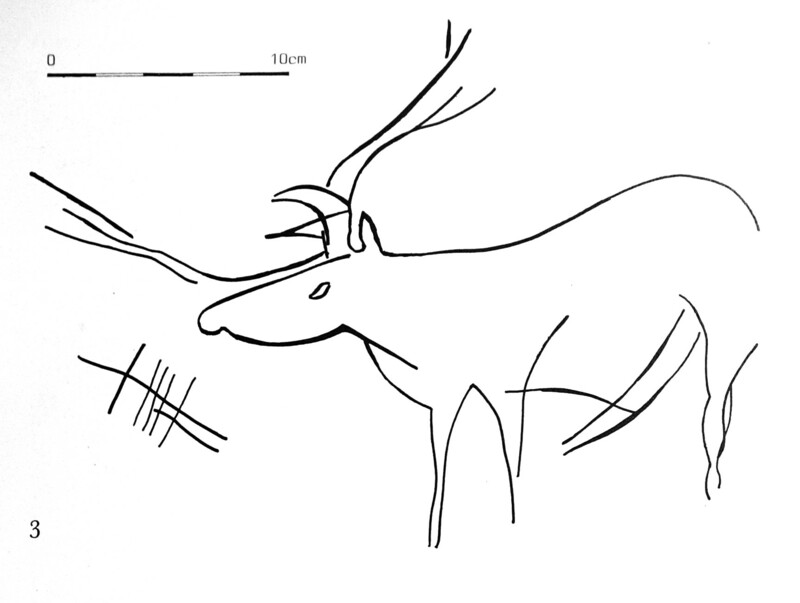 (Hubert Pepper), 1982.
c. Reindeer engraved on bone, Massât; Ariège, France. Musée Ste. Germaine, Paris. Sketch by H.P. Deffarge R., Laurent P., de Sonneville-Bordes D., 1975: Art mobilier du Magdalénien supérieur de l'Abri Morin à Pessac-sur-Dordogne (Gironde), Gallia préhistoire, Tome 18 fascicule 1, 1975. pp. 1-64. Géroudet P., 1965: Les Rapaces diurnes et nocturnes d'Europe, Université Lumière-Lyon 2, Delachaux & Niestlé, 6ème édition (1984), Paris, 426 p.
Le Dren D., 1960: La grotte de la Forêt à Tursac, Bulletin de la Société d’Études et de Recherches des Eyzies, nombre 9, p. 46-48 (relevé d'A. Glory). Maligne M., Langlais J., Barshay-Szmidt C., 2012: Des restes de chiens magdaléniens à l’abri du Morin (Gironde, France). Implications socio-économiques d’une innovation zootechnique, PALEO, 23 / 2012, pp. 39-54. 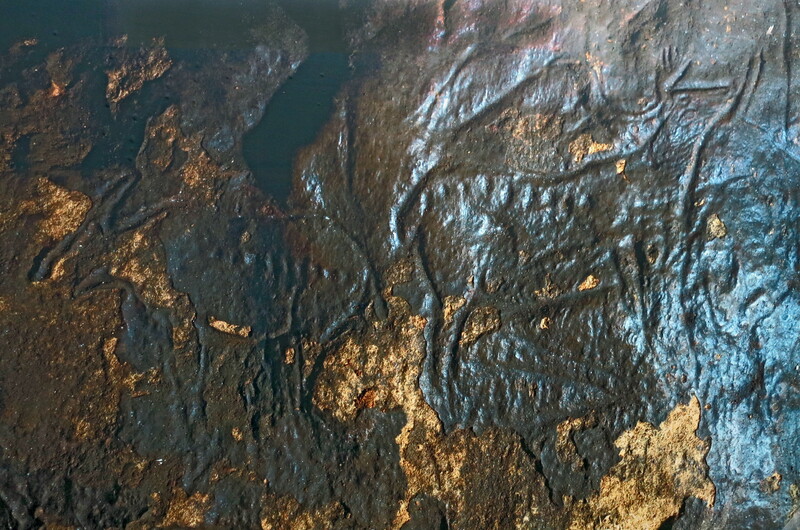 Saachi D., 1972: Une Curieuse gravure d'oiseau dans le gisement magdalenien de Belvis (Aude), Zephyrus, 7S-4: 189-192.